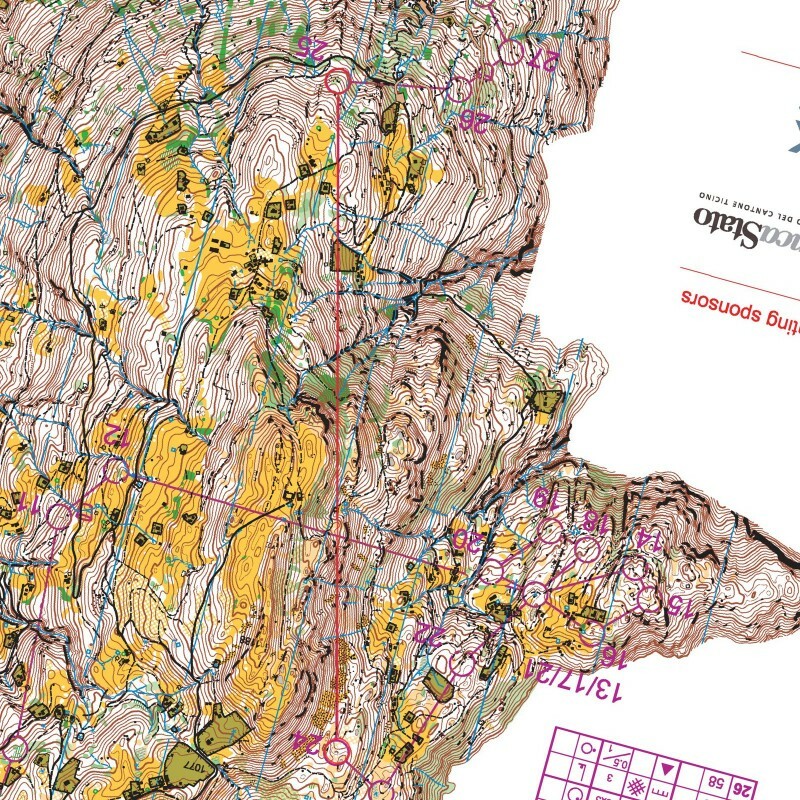 Olav Lundanes (NOR) won a very tight battle in the men’s class at the European Championships (EOC) long distance 2018 while Tove Alexandersson (SWE) was 5 minutes ahead of her competitors in the women’s class. 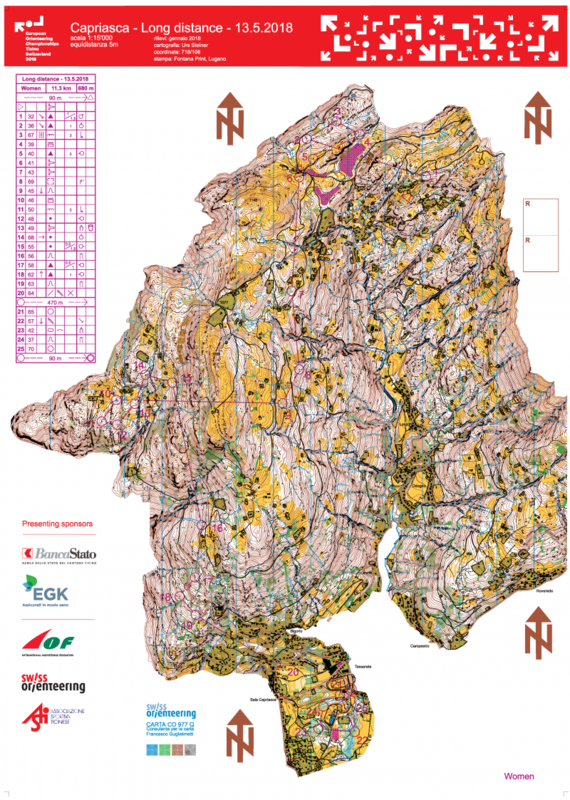 The long distance marked the end of the championships in Tessin, Switzerland. This was the first day without a Swiss gold medal – in a championship which the Swiss have dominated from the start. In the men’s class Lundanes won 53 seconds ahead of Swiss gold medalist from Sprint and Middle – Matthias Kyburz with Gernot Kerschbaumer (AUT) in third. Kerschbaumer showed excellent shape earlier this spring, but missed the cut in the qualification at both Sprint and Middle – his first championships medal must have tasted very good after that start to the championships. In the women’s class Natalia Gemperle (RUS) was second with Julia Gross (SUI) in third. Gross’s bronze medal must have had a similar sweet taste as Kerschbaumer’s, after Gross celebrated the victory at the Middle distance for 3 minutes before discovering that she had forgotten one control and was disqualified. 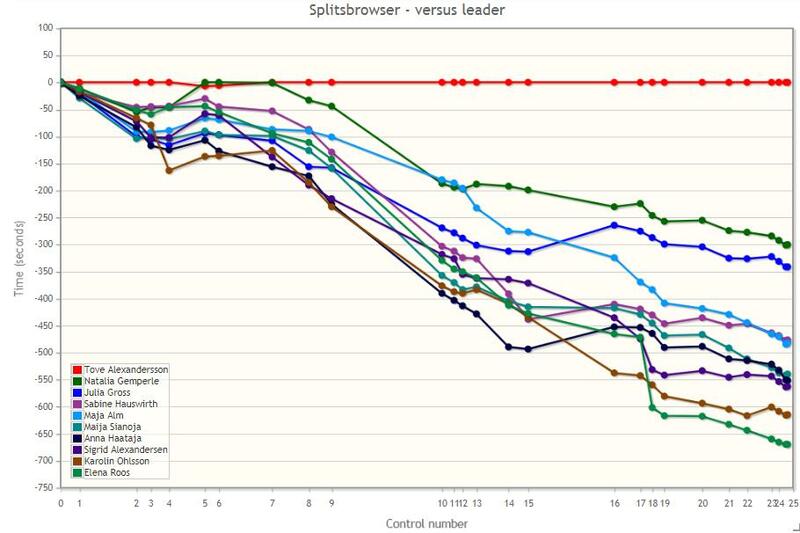 Taking a look at the race development through a graphical split time graph, one can clearly see how important leg 25 was for the overall. 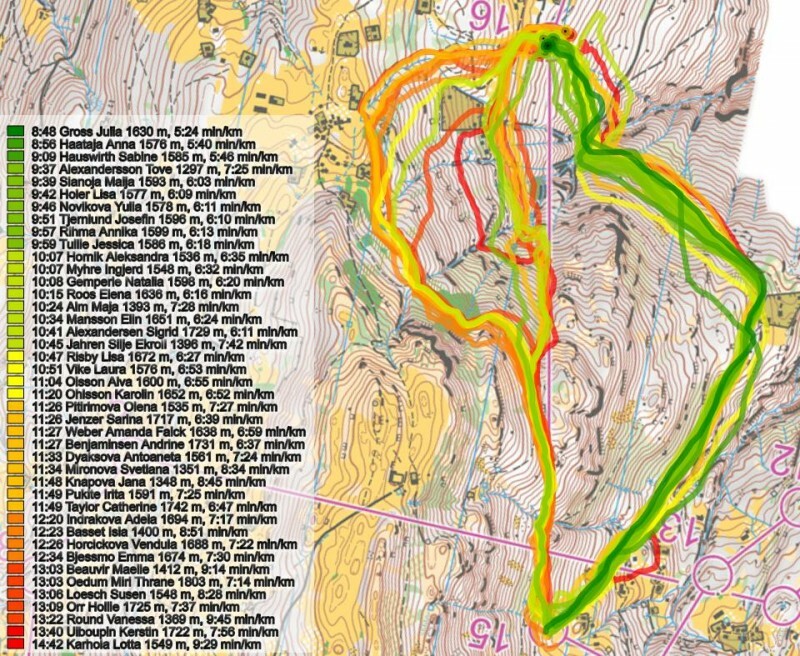 Other legs which spread the runners are leg 13 (this is where Kyburz builds up his lead while several others lose time; notably Daniel Hubmann loses more than a minute). Also Fabian Hertner loses a lot of time at the short legs to control 6 and 29 – taking him from a possible medal to an 8th place. In the men’s class Lundanes battled for Gold with Matthias Kyburz, Daniel Hubmann (both SUI), Gernot Kerschbaumer (AUT) and Frederic Tranchand (FRA). 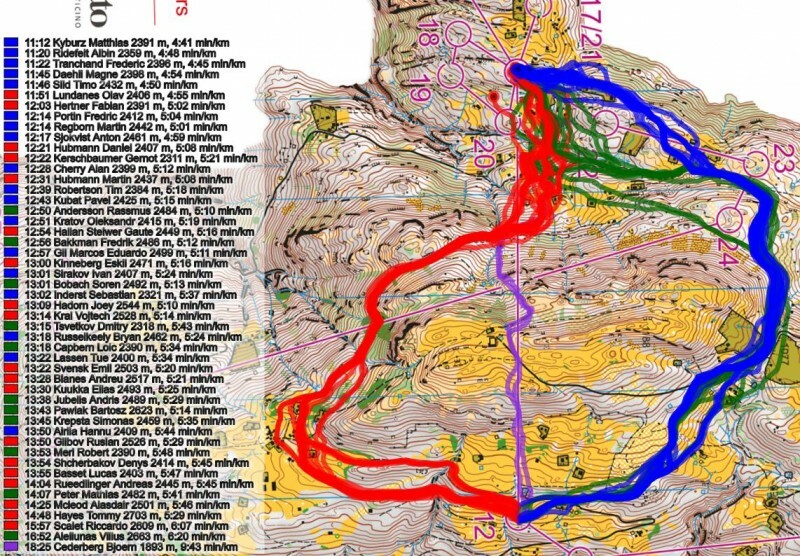 In the end the long leg to control 25 (see below – and at the top of the page with coloring according to split-time) was decisive. 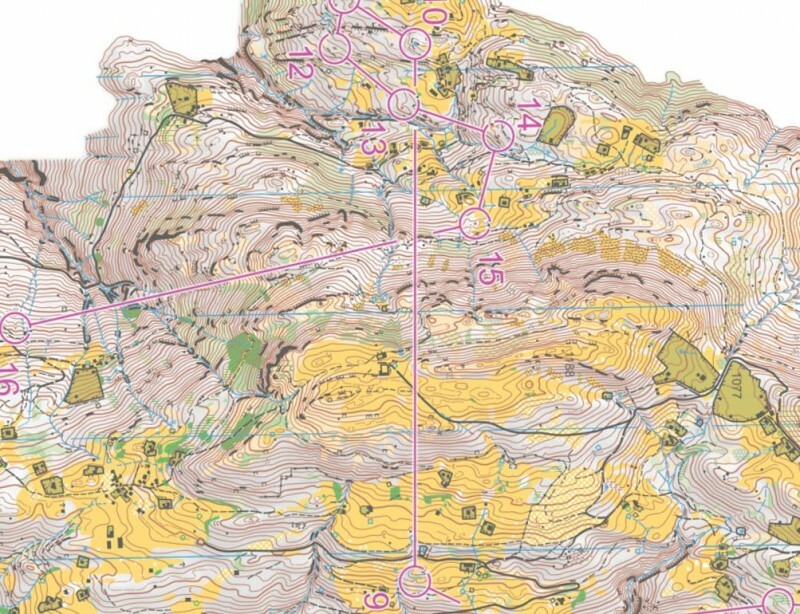 Hubmann (finishing in 5th place, 1:53 behind Lundanes, in the end) lost nearly 3 minutes to Lundanes on this leg taking the wrong routechoice, running to the right while Lundanes along with most of the field chose a more direct approach. Tranchand (finishing in 4th place, 1:27 behind Lundanes, in the end) lost nearly 2 minutes here by also taking a wrong routechoice (Tranchand went left while Hubmann went right). 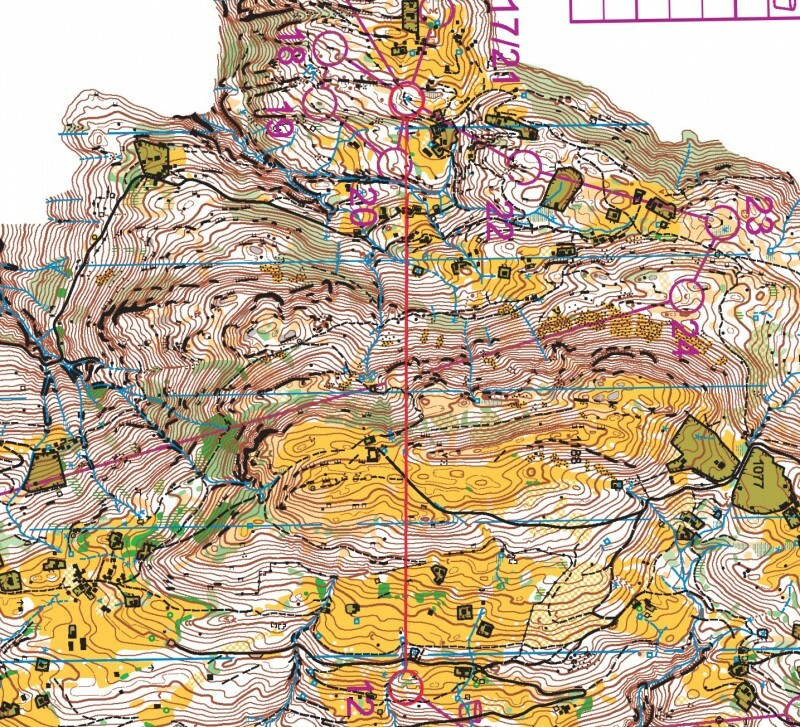 Kyburz took the correct route choice, but lost nearly 2 minutes here due to a mistake when approaching the control (finishing in 2nd place, 0:53 behind Lundanes, in the end). Several other highly placed runners also either missed the control or took the wrong routechoice, e.g. Magne Dæhli. 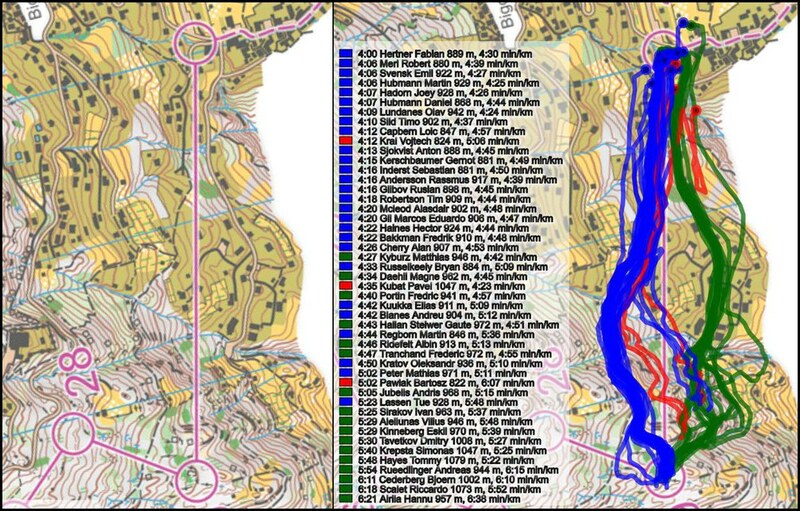 The long leg to control 13 was also a routechoice leg which had some impact on the race standing, although the time differences were smaller than for leg 25. 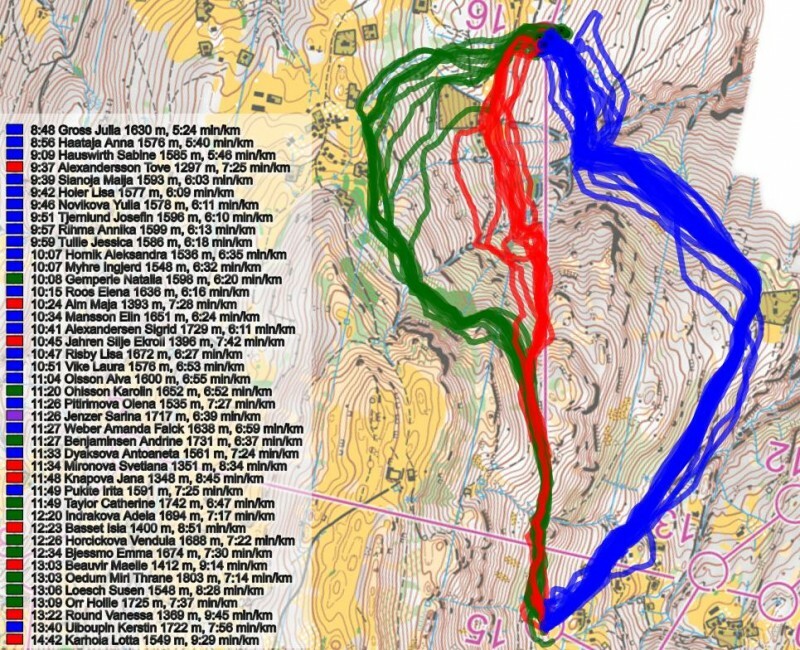 Here right (blue below) is around 30-50 seconds faster then left (red) – Lundanes actually takes left and loses 39 seconds to Kyburz and so does Daniel Hubmann who loses another 30 seconds due to non-optimal running towards the end of the leg. 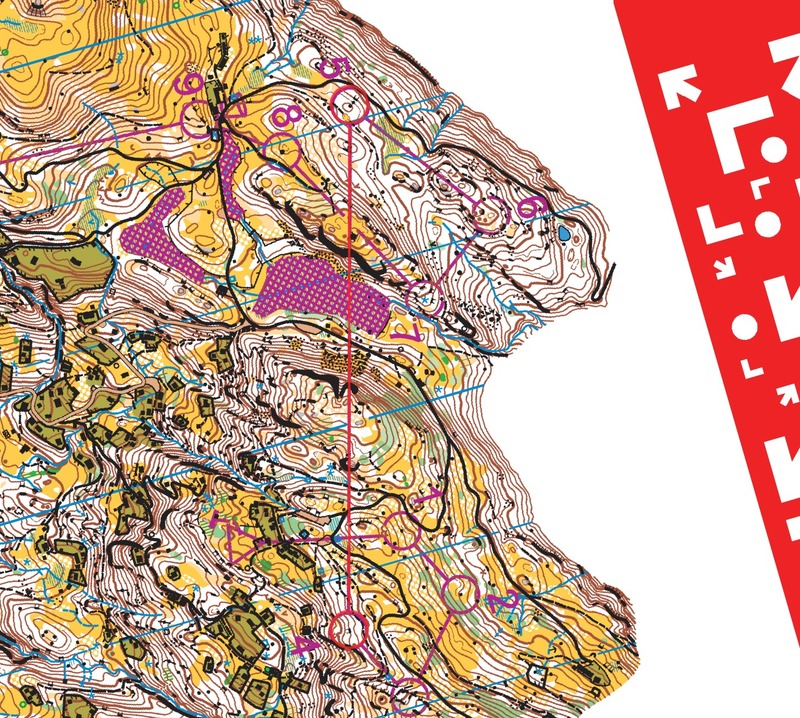 The third interesting routechoice leg on the course was the leg to control 6. Here, however, left and right are nearly equal in time (Hertner runs right, Hubmann left – with only 2 seconds time difference). The ones starting from right and finishing left in an S-shape do however lose a minute or more. On the leg to control 30 Kyburz takes the slower route (right, green below), but the time loss is limited to around 20-30 seconds. Leg 10 is also a routechoice leg, but here only Tranchand takes the wrong route of the top runners (green, to the right), losing some 30-40 seconds. Kerschbaumer takes a more direct route, but the timeloss on the direct approach is quite small. 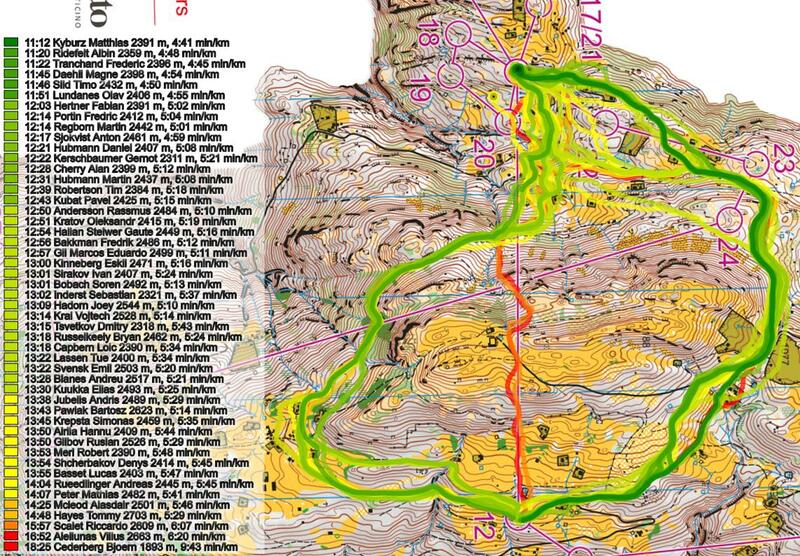 Looking at the race development for the women, it is all about Tove Alexandersson. 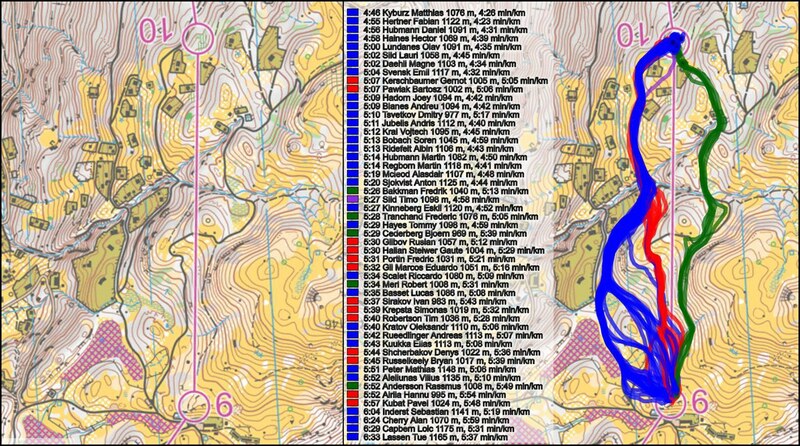 The others keep up until control 7 – partly helped by Alexandersson losing a minute on control 5. Then Alexandersson beats most of the others on the leg to control 8 – and is really dominant on the long leg to control 10. 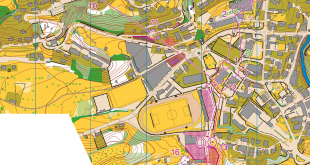 Alexandersson then runs a non-optimal long leg to control 16, but she is already so far ahead of the rest that nobody gets even close. 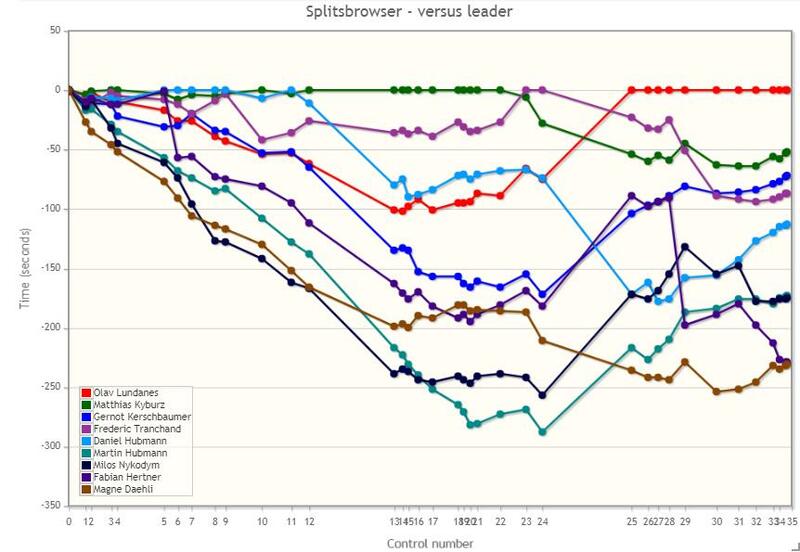 To look into the battle for the medals, it is instructive to look at a graphical split times graph where Alexandersson is removed. 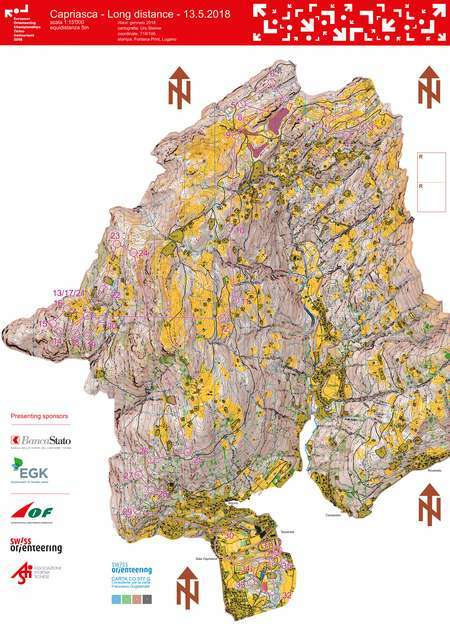 Looking at silver medalist Natalia Gemperle’s race, she has lost a lot of time to the other at the two long legs to control 10 and 16 and also on the routechoice leg to control 8 – but good speed and orienteering in the remainder of the race saves her the silver medal. 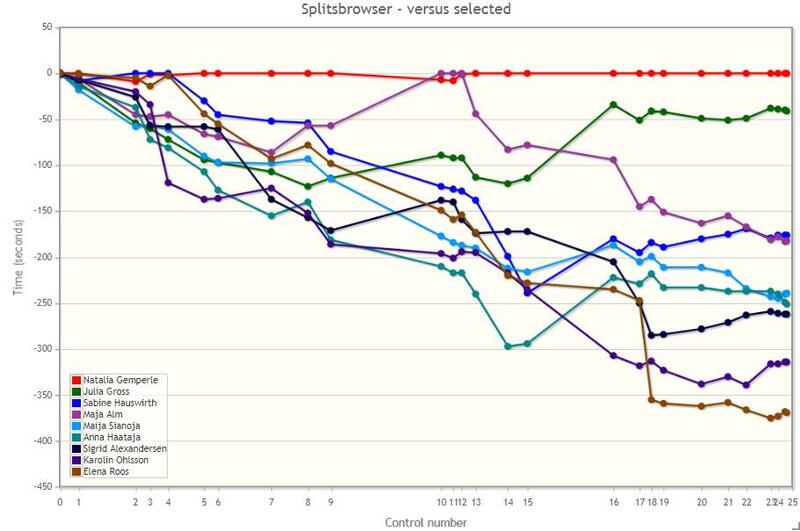 Here one can also observe how Maja Alm is in silver medal position at control 12, but then loses time both to 13, 14 (mistakes on the control) and 16 (routechoice, see below). Julia Gross on the other hand runs very well on the long leg to control 16, and passes Alm in the standings. 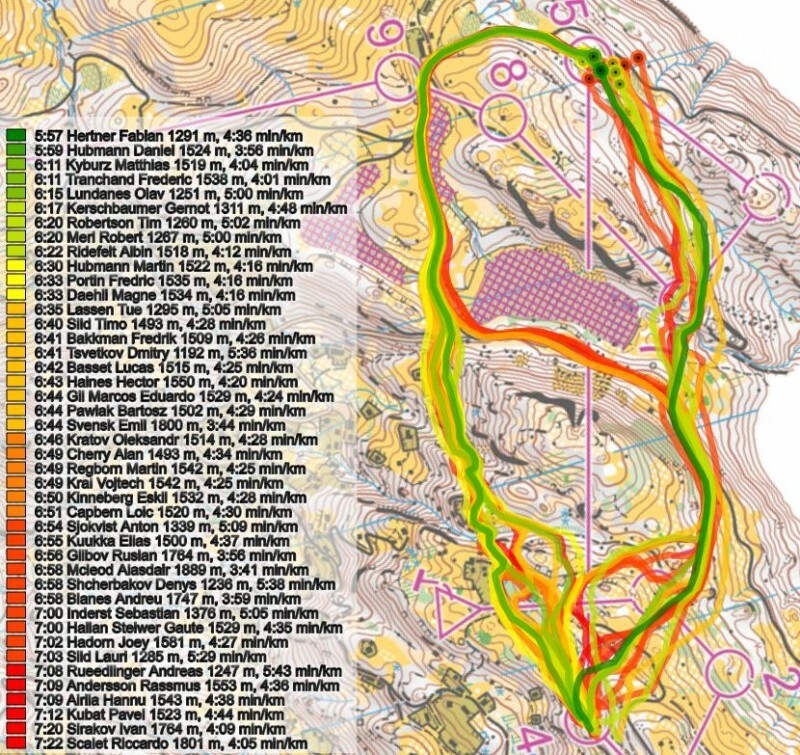 On leg 8 we see how Tove Alexandersson is so much faster than the rest of the field. 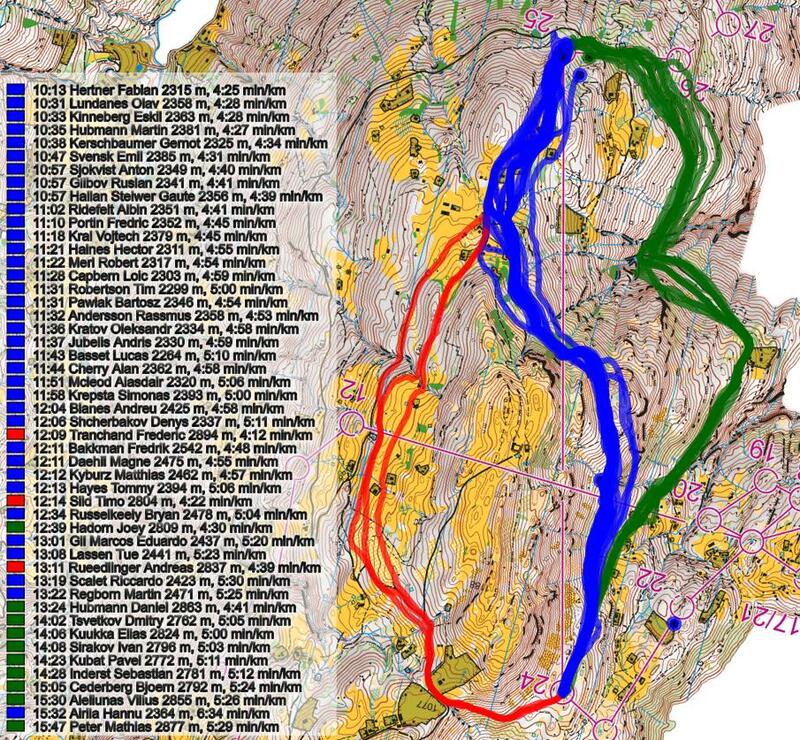 The best route here is going to the left/straight, but Alexandersson goes right and still wins the leg! Gemperle and Gross also run right but loses more than a minute. 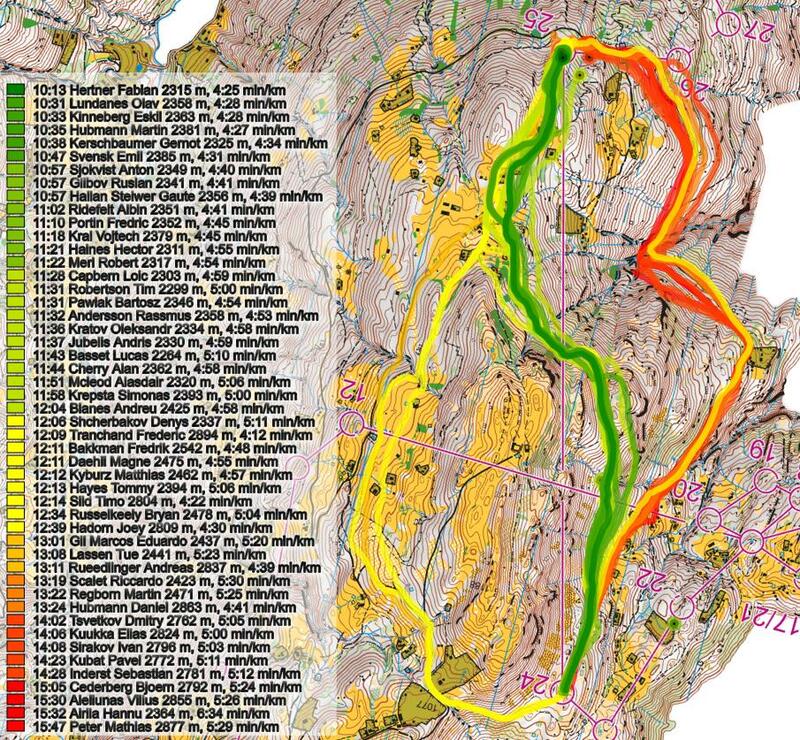 Leg 10 is the long leg where Alexandersson really shows her class, winning the leg with more than a minute! Going right as Alexandersson does is clearly the correct choice here. Gemperle goes left and loses more than 2 minutes to Alexandersson. Several other top-favourites runners also run left and lose 2-4 minutes, e.g. Elena Roos, Sabine Hauswirth and Andrine Benjaminsen. 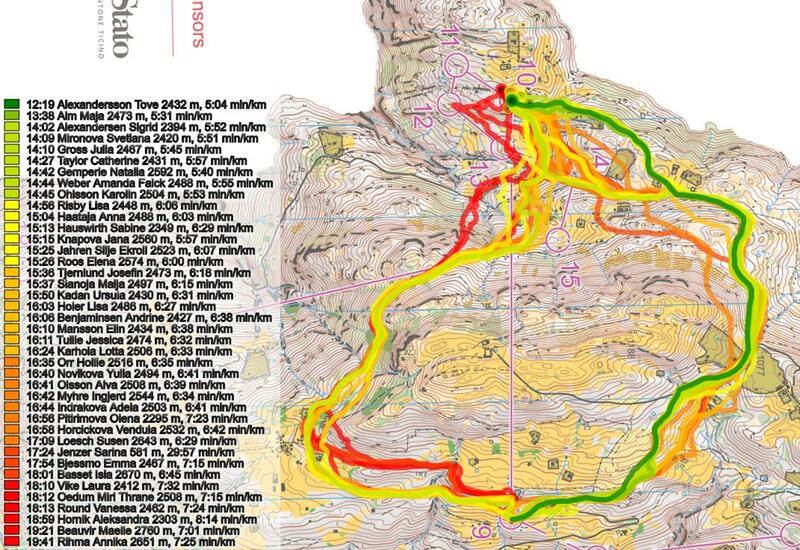 On leg 16 going right is significantly faster – between 60 and 90 seconds faster. Alexandersson goes straight and loses nearly a minute to Julia Gross who wins the leg. 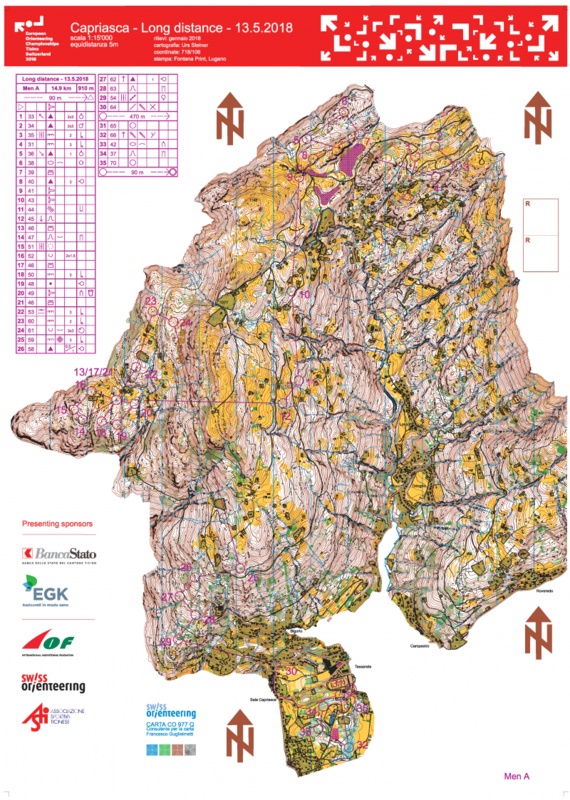 See below for maps and GPS-tracking from the EOC 2018 Long distance races. Didn’t you mean to control 5? 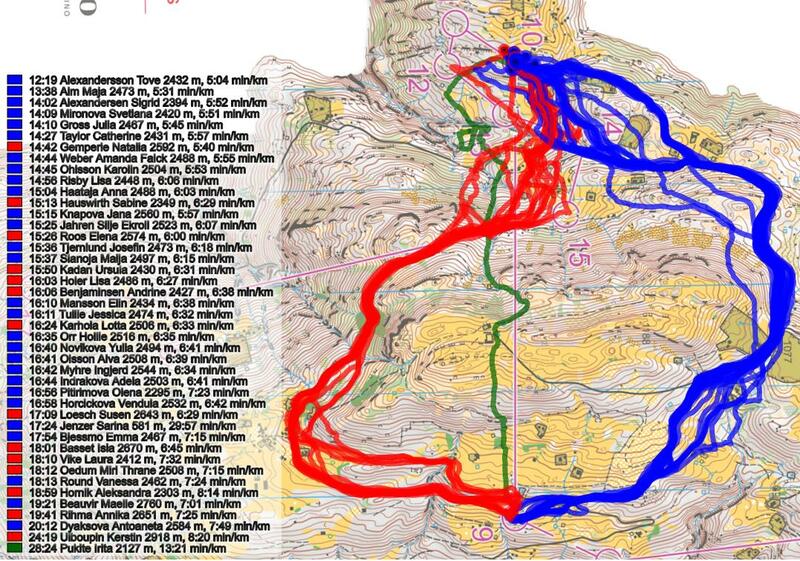 I’m colour blind and much prefer the route analysis with the blue routes you’ve been using. Red, Blue, Green is easier to see than the Green, Yellow, Red diagrams. Red, Blue and Yellow would be even better! Keep up the great work – really interesting stuff.